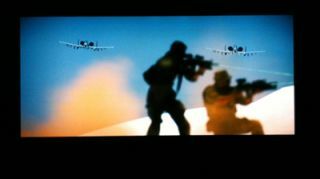 CEDIA SHOW 2011: Panasonic shows off the world’s largest 3D plasma display | What Hi-Fi? Panasonic has imported the world’s largest 3D display – a 152in plasma screen – as the centrepiece of its 3D zone here at CEDIA 2011. Cost? A staggering £550,000! It arrived from Paris this morning, but unfortunately without its 3D transmitter. We’re promised that will arrive this afternoon so we can get a full demo. Mind you, 2D picture quality looks awesome from what we've seen so far. Thw TH-152UX1 is part of the company’s UX1 ‘life-size’ Full HD 3D screen range. Here it’s partnered with Arcam amplification, a Denon Blu-ray player and KEF Reference speakers, provided by AWE Europe. JVC also has a demo in the 3D zone, using its latest 3D D-ILA projectors. It’s showing all three models in the range, the DLA-X3, DLA-X7 and DLA-X9. Surround sound is provided by speakers from B&W. We’re also booked to see the ‘ultimate 3D experience’ from SIM2 and Anthem AV Solutions at 4pm, featuring the new SIM2 Lumis 3D-S active-shutter projector (above) with triple flash technology. More details to follow.